Key events in 2014 provided a critical impetus for the global fight against malnutrition in all its forms and for nutrition justice. Malnutrition being a result of the failure to realize people’s basic human rights, addressing it is indeed a matter of justice. 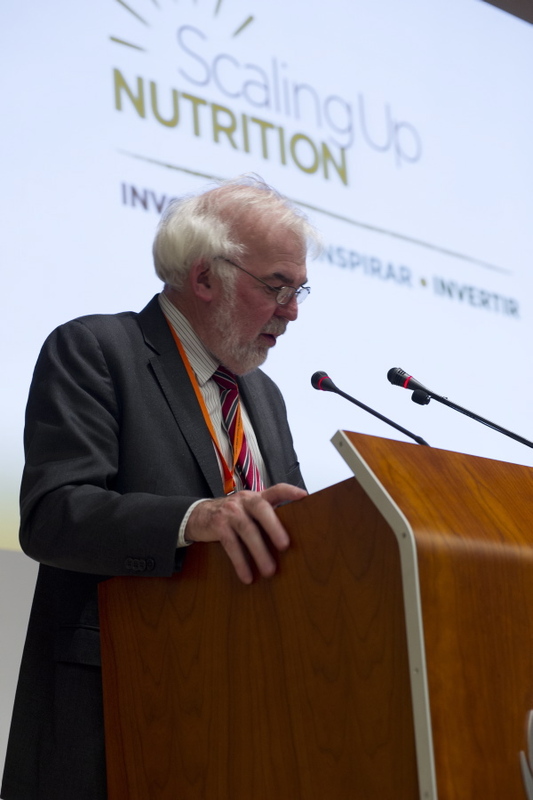 The Scaling Up Nutrition (SUN) Movement’s Global Gathering in November 2014 highlighted the need for continuous collaboration of all stakeholders in strengthening nutrition actions in countries. The first Global Nutrition Report presented a clear picture of global malnutrition with emphasis on key successes and inherent challenges. Prime amongst these events in 2014 were the processes that culminated in the Second International Conference on Nutrition (ICN2) in Rome. This galvanized renewed commitments towards ending malnutrition as Member States endorsed the Rome Declaration on Nutrition and the Framework for Action. Ensuring access to better nutrition for all people, particularly women and children, remains the central focus of the Rome Declaration. It is also the overarching goal of the SUN Movement. However, if as a global community we are to meet these ambitious – but achievable – goals, we must all continuously and critically review our work to ensure that commitments are translated into actions. We need to continue this momentum throughout 2015 and beyond. For the SUN Movement, the call for greater accountability and the commitment to support country efforts to scale up nutrition will serve as the springboard to its updated strategy beyond 2015. The broader post-2015 development agenda will offer a platform for stakeholders at international, national and subnational levels to strengthen the monitoring of results and the sharing and learning amongst countries and all stakeholders: governments, donors, civil society and the business sector. Ensuring accountability will encompass the extent to which commitments are made and responsibilities allocated to ensure the goals are achieved. In essence, this framework should provide the necessary grounding for defining clear roles and responsibilities for all stakeholders involved in the struggle for nutrition justice. At the international level, the United Nations (UN) System has a major role to play in providing the necessary policy guidance and capacity building for nutrition-related actions. While international actors can support with resourcing for accountability, at the national level, governments should continue to take the lead in assessing and implementing targeted measures to improve the nutritional status of all citizens. These actions can further permeate into decentralized governance structures, with emphasis on community-centered and gender-sensitive approaches. Civil society groups also have a vital role to play by embarking on community nutrition sensitization campaigns, advocating for increase in investments, and better nutrition governance and transparency in nutrition spending. In the SUN Movement, we will continue to work to strengthen the alignment of the four support constituents (UN, donor, business and civil society) towards supporting the 55 countries which have committed to scaling up nutrition. Aligning behind country plans will enhance peer learning and mutual accountability. Ensuring accountability in the post-2015 development agenda will require the reinforcement of appropriate mechanisms at all levels to measure results. A prerequisite to assessing outcomes is having the necessary information and corresponding monitoring and evaluation systems to track and analyze progress. This is highlighted in the Global Nutrition Report, which identifies the enormous data gaps in global malnutrition prevalence and advocates for credible and timely data to hold stakeholders accountable for their commitment to deliver nutrition services. Having such robust systems in place enables governments to assess the impact of their policies and programmes and course-correct as necessary. The experience of countries in the SUN Movement highlight the importance of going beyond collecting data to developing capacity for studying data in a way that can influence policy-making and implementation. This understanding forms the bedrock of the approach developed and tested within the SUN Movement to support the establishment and use of nutrition information platforms at national and subnational levels. The intended platforms can help to monitor progress and determine associations to build plausible arguments on the (cost) effectiveness of different interventions and strengthen mutual accountability. Accountability in the post-2015 development agenda should help identify the roles and responsibilities of actors at different levels while ensuring appropriate mechanisms to measure progress. Both are dependent on the capacity to monitor and implement actions, and more importantly, the availability and access to financial resources. While several commitments have been made by governments and key actors at the Nutrition for Growth summit in 2013, among other events, it remains vital to put in place measures to track these commitments. Tracking commitment can be achieved through joint partnerships and advocacy for better transparency. Conscious efforts need to be made to improve transparency in nutrition spending by encouraging consistent tracking and reporting by donors and national governments. The SUNMovement will continue to prioritize mobilizing political support, aligning behind a common results frameworks in countries and ensuring the devotion of sufficient amounts of resources to nutrition actions. It has already initiated actions to help governments track the amount of resources allocated to nutrition-specific and nutritionsensitive actions. Ensuring better accountability for nutrition in the post- 2015 development agenda begins with expressing the need for nutrition indicators within the Sustainable Development Goal 2 (SDG2) on ending hunger, achieving food security, improving nutrition and promoting sustainable agriculture. Again, there is still an opportunity for more nutrition indicators by linking these to the other SDGs, especially the positive correlation between the empowerment of women and girls to the nutritional outcomes of all. The six global nutrition targets agreed by Member States at the World Health Assembly (WHA) in 2012 provide a platform which can be reinforced using the post-2015 agenda. Integrating the WHA targets will help build upon the ongoing multistakeholder planning and actions in countries towards the achievement of the targets. This will ensure the sustainability of nutrition efforts at the global and national levels while maintaining nutrition as a priority during and beyond the next decade. Having nutrition imprinted in the SDGs framework will provide the necessary stepping stone for setting up and strengthening accountability frameworks to monitor and demonstrate results.